A fuel tank (or petrol tank) is a safe container for flammable fluids. Though any storage tank for fuel may be so called, the term is typically applied to part of an engine system in which the fuel is stored and propelled (fuel pump) or released (pressurized gas) into an engine. Fuel tanks range in size and complexity from the small plastic tank of a butane lighter to the multi-chambered cryogenic Space Shuttle external tank. Storage of fuel: the system must contain a given quantity of fuel and must avoid leakage and limit evaporative emissions. Filling: the fuel tank must be filled in a secure way, without sparks. Provide a method for determining level of fuel in tank, gauging (the remaining quantity of fuel in the tank must be measured or evaluated). Venting (if over-pressure is not allowed, the fuel vapors must be managed through valves). Feeding of the engine (through a pump). Anticipate potentials for damage and provide safe survival potential. While most tanks are manufactured, some fuel tanks are still fabricated by metal craftsmen or hand-made in the case of bladder-style tanks. These include custom and restoration tanks for automotive,aircraft, motorcycles, and even tractors. Construction of fuel tanks follows a series of specific steps. The craftsman generally creates a mockup to determine the accurate size and shape of the tank, usually out of foam board. Next, design issues that affect the structure of the tank are addressed - such as where the outlet, drain, fluid level indicator, seams, and baffles go. Then the craftsmen must determine the thickness, temper and alloy of the sheet he will use to make the tank. After the sheet is cut to the shapes needed, various pieces are bent to create the basic shell and/or ends and baffles for the tank. Many fuel tanks' baffles (particularly in aircraft and racecars) contain lightening holes. These flanged holes serve two purposes, they reduce the weight of the tank while adding strength to the baffles. Toward the end of construction, openings are added for the filler neck, fuel pickup, drain, and fuel-level sending unit. Sometimes these holes are created on the flat shell, other times they are added at the end of the fabrication process. Baffles and ends can be riveted into place. The heads of the rivets are frequently brazed or soldered to prevent tank leaks. Ends can then be hemmed in and soldered, or flanged and brazed (and/or sealed with an epoxy-type sealant) or the ends can be flanged and then welded. Once the soldering, brazing or welding is complete, the fuel tank is leak-tested. The maximum distance a combustion-engine powered car with a full tank can cover is the product of the tank capacity and its fuel efficiency (as in miles per gallon). While larger tanks increase the maximum distance, they also take up more space and (especially when full) add to the total weight, requiring higher fuel consumption for the same performance. Fuel-tank capacity is therefore the result of a trade-off in design considerations. For most compact cars, the capacity is in the range 45–65 litres (12–17 US gal); the original model Tata Nano is exceptional with its 15 litres (4 US gal) fuel tank. SUVs and trucks tend to have considerably larger fuel tanks. For each new vehicle a specific fuel system is developed, to optimize the use of available space. Moreover, for one car model, different fuel system architectures are developed, depending on the type of the car, the type of fuel (gasoline or diesel), nozzle models, and region. Plastic high-density polyethylene (HDPE) fuel tanks made by blow molding. This technology is increasingly used as it now shows its capacity to obtain very low emissions of fuel (see Partial zero-emissions vehicle). HDPE can also take complex shapes, allowing the tank to be mounted directly over the rear axle, saving space and improving crash safety. Initially there were concerns over the low fracture toughness of HDPE, when compared to steel or aluminum. Concern for safety and long term ability to function should be considered and monitored. Metal (steel or aluminum) fuel tanks welded from stamped sheets. Although this technology is very good in limiting fuel emissions, it tends to be less competitive and thus less on the market, although until recent times automotive fuel tanks were almost exclusively made from sheet metal. Modern cars often feature remote opening of the fuel tank fuel filler flap using an electric motor or cable release. For both convenience and security, many modern fuel tanks cannot be opened by hand or otherwise from the outside of the car. Sometimes called the reserve tank is a secondary fuel tank (in many cars/bikes it contains around 15% of the capacity of the primary tank) these are more commonly found on bikes, older cars (some without a fuel gauge) and vehicles designed for long distance or special use. A light on the instrument panel indicates when the fuel level dips below a certain point in the tank. There is no current standard, although some efforts are made to collect this data for all automobiles. In vehicles modified for endurance the primary tank (the one that comes with the car) is made into a reserve tank and a larger one installed. Some 4x4 vehicles can be fitted with a secondary (or sub-tank) by the dealership. A racing fuel cell has a rigid outer shell and flexible inner lining to minimize the potential for punctures in the event of a collision or other mishap resulting in serious damage to the vehicle. It is filled with an open-cell foam core to prevent explosion of vapor in the empty portion of the tank and to minimize sloshing of fuel during competition that may unbalance the vehicle or cause inadequate fuel delivery to the motor (fuel starvation). The designation "racing" is often omitted due to familiarity and because this type of gas tank is also used on street vehicles. The omission can lead to confusion with other types of fuel cells. See Fuel cell (disambiguation). For safety considerations, in modern cars the fuel tank is usually located ahead of the rear axle, out of the crumple zones of the car. Automobiles such as the Ford Pinto or the models that still use the Ford Panther platform (Ford Crown Victoria, Lincoln Town Car, and Mercury Grand Marquis) are notorious for having the fuel tank behind the rear axle. Since 1980 new Ford models corrected this problem and had the fuel tank in front of the rear axle. General Motors 1973-1987 C/K pickup trucks have the fuel tank located outside the frame. According to the Center for Auto Safety this creates a fire hazard. In automotive applications, improper placement of the fuel tank has led to increased probability of fire in collisions. Circa 1990, General Motors faced over a hundred product liability lawsuits related to fires allegedly caused by GM's decision to place the fuel tanks in its pickup trucks outside the protection of the vehicle's frame. In 1993, reportage on this matter for NBC News created a scandal over vehicles rigged to catch fire for the television camera. Ford's Pinto also sparked controversy for putting the fuel tank in a poorly reinforced area which can cause deadly fires and explosions if the car got into a rear end collision, costing Ford US$125 million. Condensation may occur in half-filled fuel tanks. Top off the fuel tanks after the engine is operated. Fuel tank should include some consideration for draining and sediment from the bottom of the tanks. Aircraft typically use three types of fuel tanks: integral, rigid removable, and bladder. Integral tanks are areas inside the aircraft structure that have been sealed to allow fuel storage. An example of this type is the "wet wing" commonly used in larger aircraft. Since these tanks are part of the aircraft structure, they cannot be removed for service or inspection. Inspection panels must be provided to allow internal inspection, repair, and overall servicing of the tank. Most large transport aircraft use this system, storing fuel in the wings, belly, and sometimes tail of the airplane. Rigid removable tanks are installed in a compartment designed to accommodate the tank. They are typically of metal construction, and may be removed for inspection, replacement, or repair. The aircraft does not rely on the tank for structural integrity. 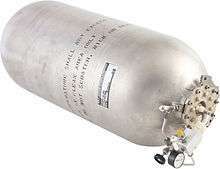 These tanks are commonly found in smaller general aviation aircraft, such as the Cessna 172. 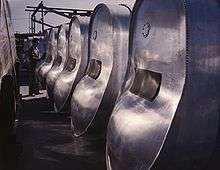 Bladder tanks, or fuel cells, are reinforced rubberized bags installed in a section of aircraft structure designed to accommodate the weight of the fuel. The bladder is rolled up and installed into the compartment through the fuel filler neck or access panel, and is secured by means of metal buttons or snaps inside the compartment. Many high-performance light aircraft, helicopters and some smaller turboprops use bladder tanks. One major down-side to this type of tank is the tendency for materials to work harden through extensive use making them brittle causing cracks. One major plus side is the ability to utilise as much of the aircraft as possible to store fuel. Combat aircraft and helicopters generally use self-sealing fuel tanks. The official "probable cause" for the explosion and subsequent crash of TWA Flight 800 is that an explosive fuel/air mixture existed in one of the aircraft's fuel tanks. Faulty wiring then provided an ignition source within the tank, destroying the airliner. While the accuracy of the official findings is still questioned in this case, similar explosions have occurred in other aircraft. It is possible to reduce the chance of fuel tank explosions by a fuel tank inerting system or fire-fighting foam in the tanks. Burning fuel can explode or set fire to the same airplane or adjacent objects and people. In the 1960 Munich Convair 340 crash, a transport crashed into a major street. Burning fuel set fire to a tramcar. All 20 people aboard the plane and 32 passengers of the tram died. In some areas, notably the USA, an aircraft's fuel tank is also referred to, slightly confusingly, as an aircraft fuel cell. Water supply systems can have primary or backup power supplied by diesel-fueled generators fed by a small "day tank" and a much larger bulk storage fuel tank. Proper design and construction of a fuel tank play a major role in the safety of the system of which the tank is a part. In most cases intact fuel tanks are very safe, as the tank is full of fuel vapour/air mixture that is well above the flammability limits, and thus cannot burn even if an ignition source were present (which is rare). Bunded oil tanks are used for safely storing domestic heating oil and other hazardous materials. Bunding is often required by insurance companies, rather than single skinned oil storage tanks. Several systems, such as BattleJacket and rubber bladders, have been developed and deployed for use in protecting (from explosion caused by enemy fire) the fuel tanks of military vehicles in conflict zones. ↑ White, Kent (November–December 2010). "Tanks A Lot - Methods for Metal Fuel Tank Development and Fabrication". Home Shop Machinist. 29 (6): 12–23. ↑ Taylor, Alexander; Redman, Christopher; Seaman, Barrett (8 September 1980). "Detroit's Uphill Battle" (fee required). Time. Retrieved 24 December 2012. ↑ "Tort Liability of Dealers Selling 1973-1987 GM Pickups". The Center for Auto Safety. 1993-10-18. Retrieved 24 December 2012. ↑ "The Mosely vs GM "Side-Saddle Fuel Tank" Case". Law Office of Roland B. Darby. 2000. Retrieved 24 December 2012. ↑ "Aircraft Fuel Cells". Floats and Fuel Cells, Inc. (FFC). Retrieved 2014-11-05. ↑ "Connecticut Personal Injury Attorney". Trantolo Law. Retrieved 24 December 2012. ↑ "Aviation Rulemaking Advisory Committee - Fuel tank harmonization working group final report" (PDF). AIA, AECMA, ATA, ALPA, IATA, FAA, JAA, GAMA, API. July 1998. Retrieved 24 December 2012. ↑ "The Leading Emergency Management Site on the Net". emergency-management.net. Archived from the original on 10 June 2010. Retrieved 24 December 2012. ↑ Comprehensive Everglades Restoration Plan, Section 8, pp 8-3, 8-4, says that small- and medium-sized pumping stations are to be equipped with fuel storage tanks capable of storing seven days capacity, plus "floor-mounted packaged system day tanks"
Wikimedia Commons has media related to Fuel tanks.